It's unnerving how quickly summer flies by. Still, we're looking forward to the second big fete of the season, The Fourth of July. While our celebration will undoubtedly include American favorites like Burgers (we love Pat La Frieda's Short Rib Blend), we'll always throw in a few extra twists to make sure our barbecue is one for the books. Today, we'll round up some of NK's favorite summer party recipes. 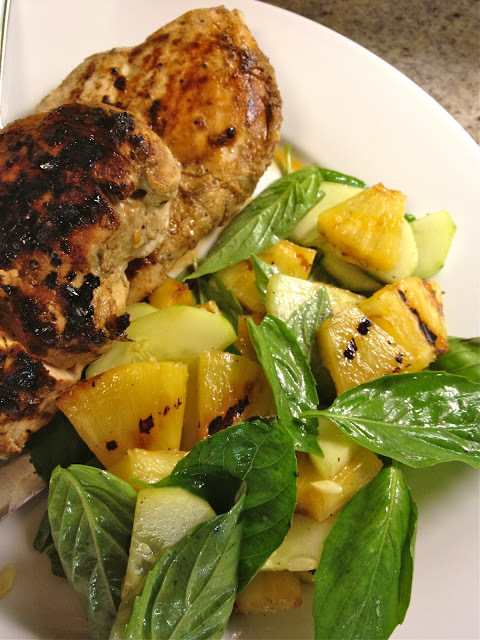 Most can be made on an outdoor grill or indoor grill pan. Hope this get's your creative juices flowing. Happy Cooking! A Hot Dog Less Ordinary - Why not try our Chicago Dogs with all the fixins on the grill? Wings! - The winner and still champion of party foods. In our house, these Old Bay Spiced Buffalo Wings are generally baked, but you can absolutely grill them as well. So. Good. Sharable Shrimp Ceviche Served with Tortilla Chips is "a good thing." We like to lightly boil our Shrimp so you won't have any raw food worries. Bring this great app if you're attending a party. 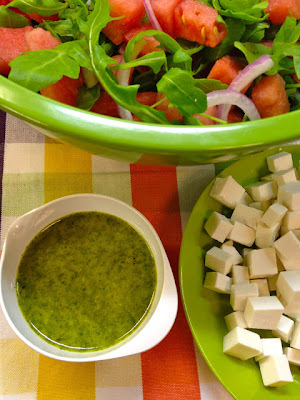 Vegetarian Pasta Salad - This as good at room temp raw sauce pasta recipe easily morphs into a winning side or main that will please all palates - we love our Vegetarian Friends. This super easy, stone-fruit driven Tart comes together quickly with frozen puff pastry. 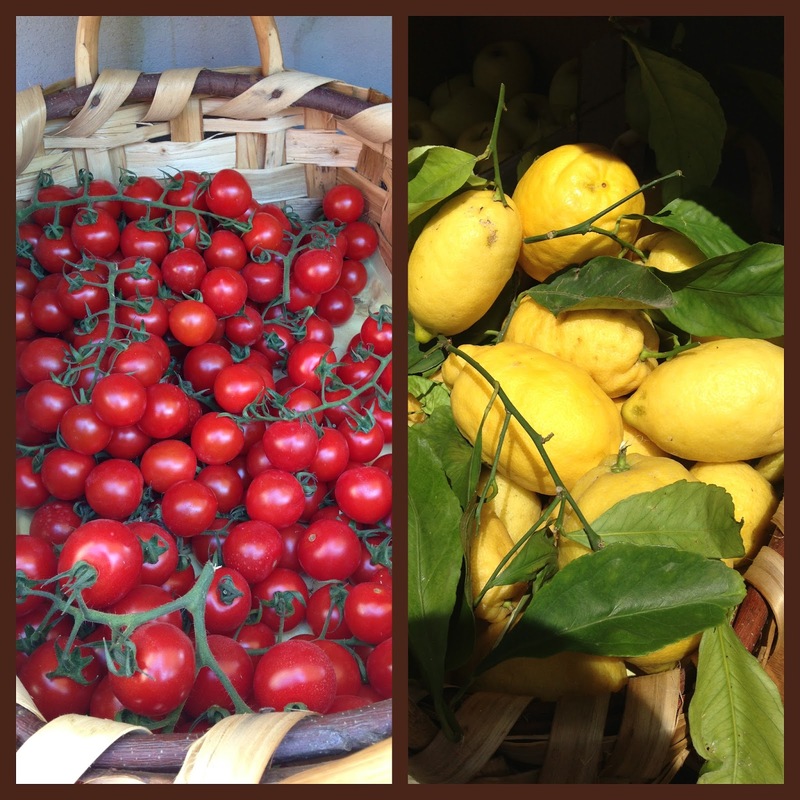 Use it to showcase the season's best produce. That'll do it. Keep us posted on your food adventures and we hope you do enjoy our Nation's birthday and all the food it brings. If you've been reading, I don't have to tell you that we've already featured several regionally themed Cheese Plates on Neurotic Kitchen. I love a cheese plate, and I don't plan on stopping my obsession anytime soon. Behold the latest, my homage to the Cheeses of Italy. This selection is mostly from cow's milk cheeses. The flavors range from mild to pleasantly tangy and piquant. Try it for a sunny addition to your next cocktail party. Not a whole lot wrong with that, right? Is there anything better than a lazy Summer weekend? This last one was a winner thanks to beautiful weather, a Super Moon, and doing a whole lotta nothing. Fresh and delicious local greens from our neighbor's garden - Thank you, Freddie! And of course, a nice bottle of this (goes great with seafood, but we'll get to that soon). My perfect weekend will almost always include a nice home-cooked dinner. 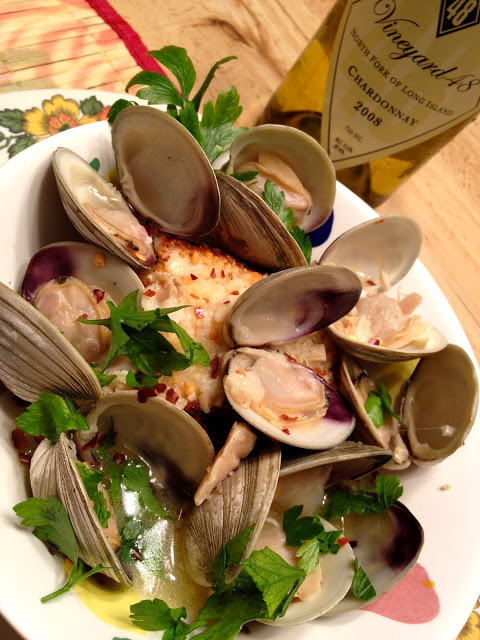 Staying on theme with our ever-growing seafood obsession (check out our previous fish feast HERE), I chose to make two deceptively simple light and elegant appetizers. For each of these recipes, all you'll need is about 20 minutes, a grill or grill pan, and a very good fish market. Lazy summer evening approved. 1. Heat a grill or stovetop grill pan until very hot. 2. Brush Scallops on both sides with some Olive Oil and sprinkle them with Salt and Pepper. 3. 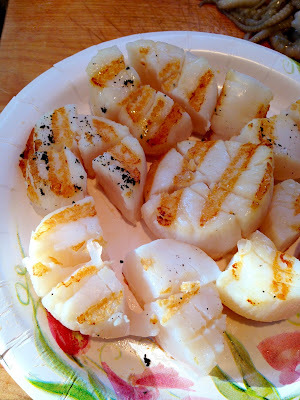 Sear Scallops on one side for about 3 minutes until grill marks appear. Flip them to the other side and cook another 1-2 minutes until firm and opaque. Set Scallops aside and allow to cool. 4. Meanwhile, mix all other ingredients together in a medium bowl to create the Salsa. 5. 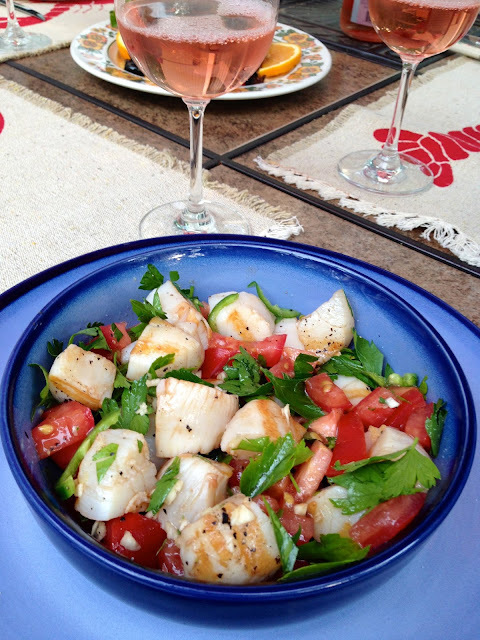 Cut Scallops into quarters and toss them into salsa. Stir. 6. Taste and season with Salt and Pepper. Serve room temperature or slightly chilled. 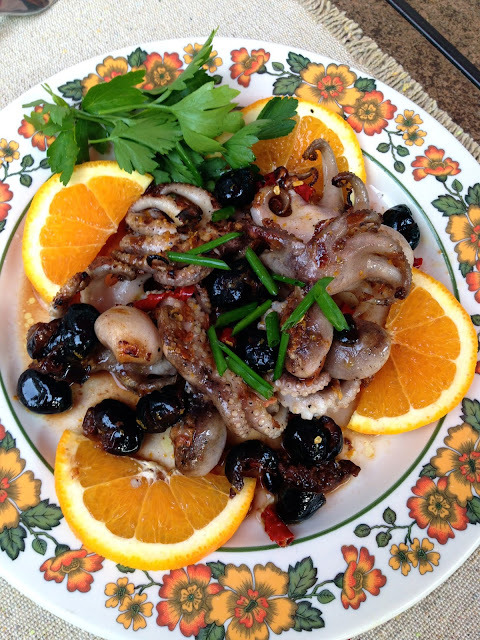 Next up, delicious Baby Octopus with Spicy Chile, Orange, and Oil-Cured Olives. 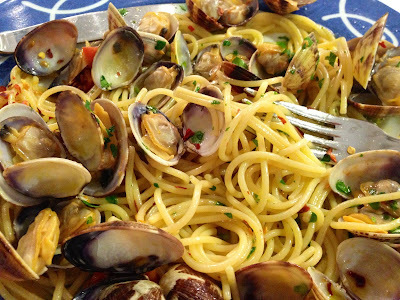 If you are averse to Octopus you could easily adapt this recipe to Calamari. The cook time may change just a bit and Calamari is done when it is opaque white and firm but not overly rubbery. Enjoy! 1. For the dressing - Combine Oil, Vinegar, Dried Chile, Orange Zest, Orange Juice, a generous pinch of Salt and Pepper and the Olives. 2. Heat a grill or grill pan until very hot. Brush Octopi with Olive Oil and sprinkle with Salt and Pepper. 3. Place Octopi on the hottest part of the grill and cook until charred and crispy, about 4 minutes per side. 4. To serve, plate Octopus with Orange Wedges and drizzle the Octopus with dressing (you may not need it all). Garnish with optional Chives and serve immediately. Our tour guide, Giulio, made the Fontana di Trevi the first stop on our day tour of Rome. At that early morning hour, the crowds thin, the air ever so slightly cool, nearby rooftops splitting the sunbeams and casting the scene in a dramatic mosaic of light and shadow, this fountain knocked the wind right out of me. 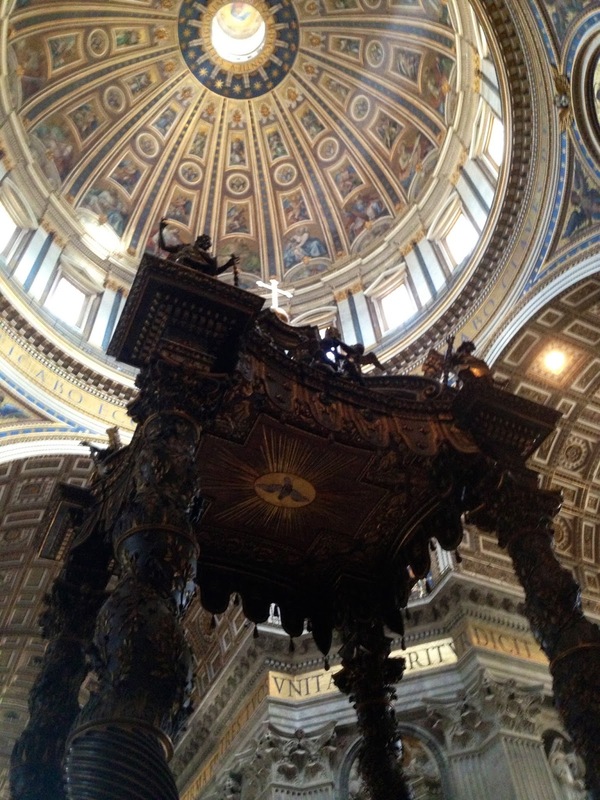 One thing about being awestruck - you just don't see it coming. I'm not sure what I was expecting the Trevi to be like. Perhaps its heavy presence in movies and pop culture caused my suspicion that it might be disappointing. Audrey Hepburn's Roman Holiday a more distant memory, I think I may have been envisioning it as it appeared in some cheesy scene from the Kristen Bell box office turkey, When in Rome. But instead, there I was - feeling shocked as I instinctively hung my head to hide the tears welling up in my eyes. I managed to hold myself together long enough to turn my back and throw a coin over my shoulder, offering my wish up as the custom dictates. Maybe it was the energy of the place, the flood of so many people's wishes, hopes, dreams, fears. Or maybe it was the sheer beauty of the fountain - its impressive sculptural qualities, the water, crystal blue-green in the bright sunshine. I don't know. But it sure was something, and this experience was a just the beginning of so many amazing sights to come in a city that truly is ever so Eternal. 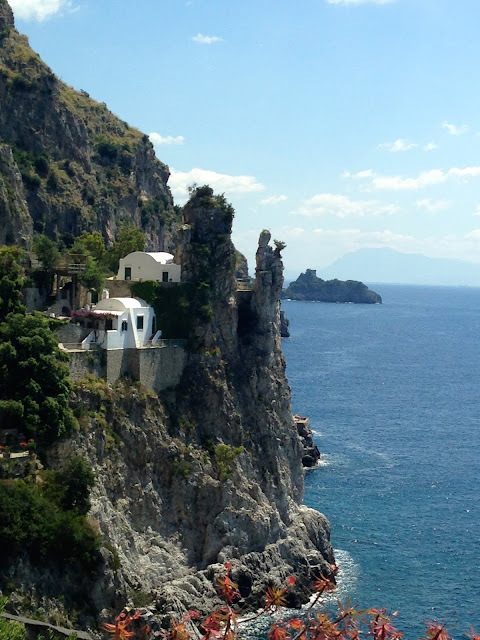 Our voyage was brilliant from start to finish, and was undoubtedly made all the more special by the fact that we had our moms with us enjoying all the breathtaking antiquity and later, the sweeping vistas and turquoise waters of the Amalfi Coast. 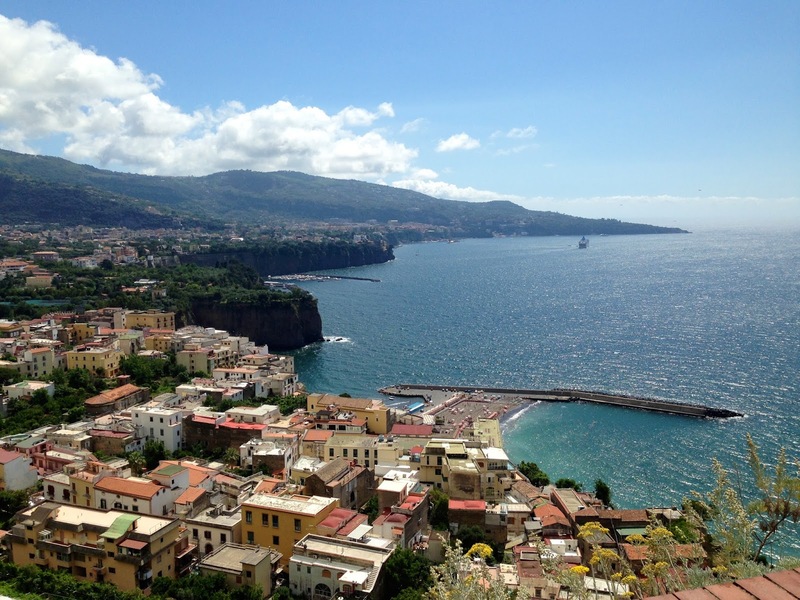 Today's post will cover our dining and general food experiences in Rome and the Amalfi Coast area, specifically Sorrento and the town of Amalfi. 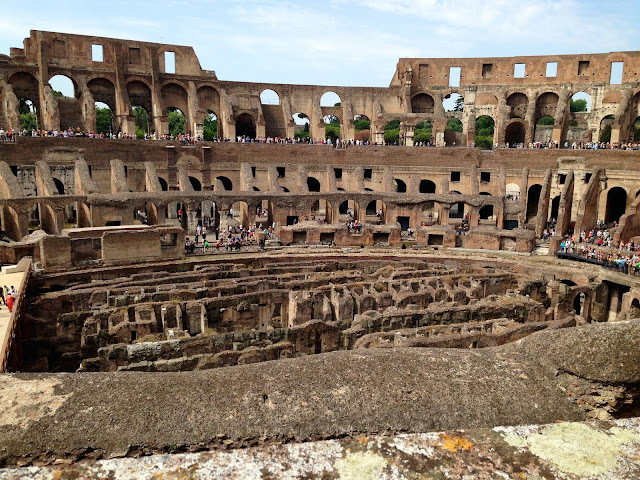 I hope that you find this information helpful, and as always, I wish you happy travels and the chance to one day see the amazing sights that Italy has to offer. Understanding the different types of dining establishments in Italy is key to figuring out what types of dishes and ambiance to expect. To learn more, click HERE. Recommended Dishes - Classic Carbonara (pictured top left), Eggplant Parmigiana (pictured bottom right), Fettucine con Funghi (mushrooms), and for dessert, they make a mean Affogato. Highlights - This excellent destination for typical Roman Fare was recommended to me by a real life Roman. 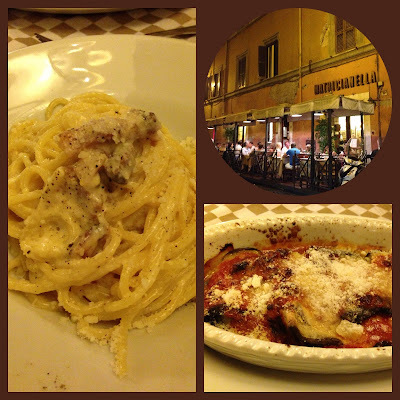 As such, I had high hopes for it, and Matricianella did not disappoint. 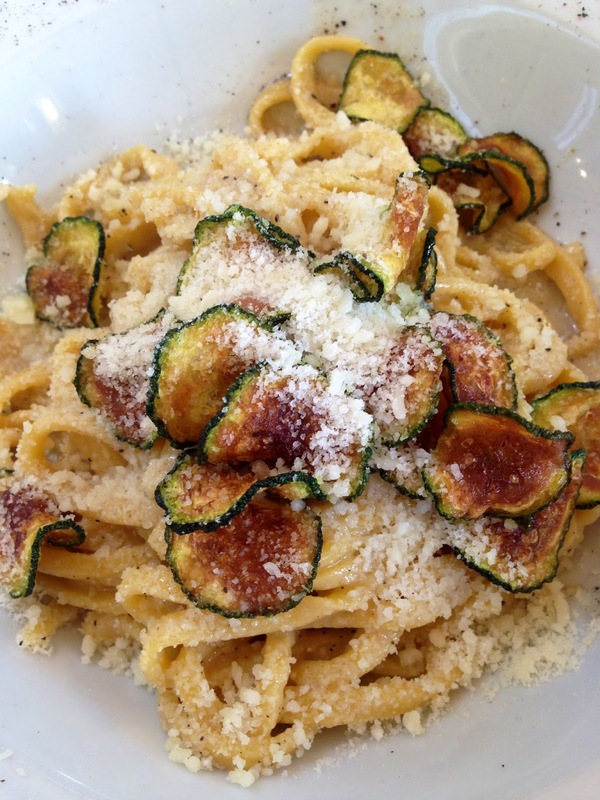 What to know - Matricianella is a true trattoria, and this festive neighborhood joint is frequented both by tourists and locals. Reservations are advised, but will not necessarily guarantee you access to the outdoor seating. The service was efficient if not a touch brusque (though at times, amusing). All in all, it was a great night. 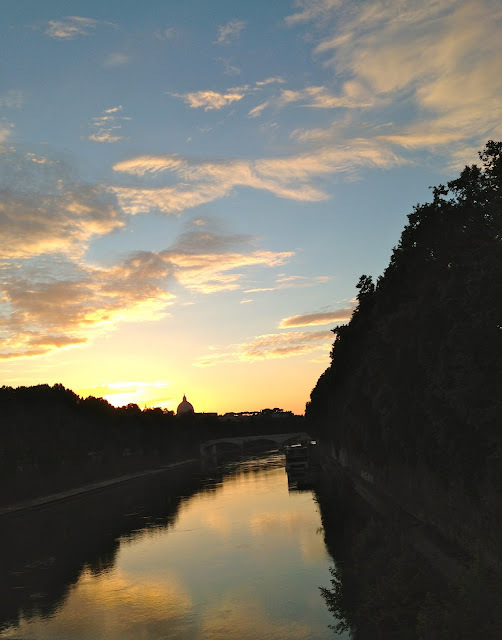 Stroll the nearby Spanish Steps afterwards to work off that pasta! 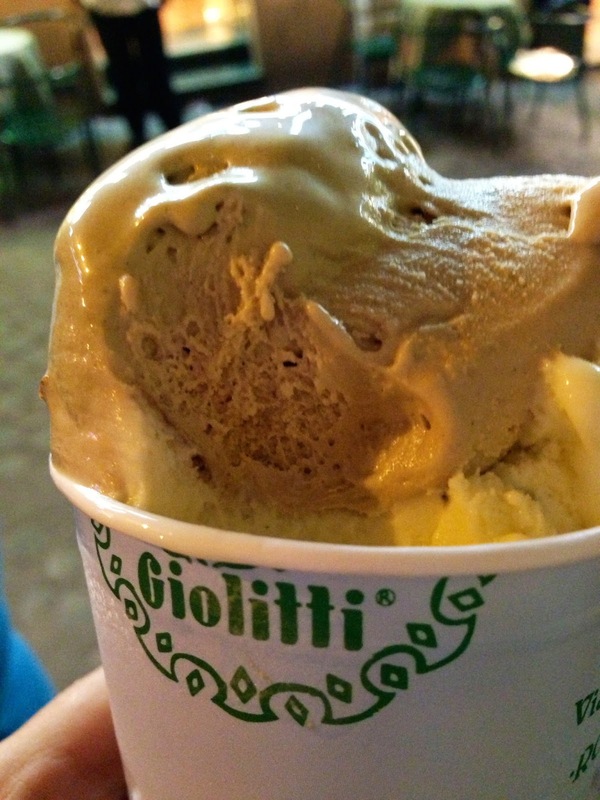 Giolitti is a big operation in Rome's historical center that stays bustling late into the night. Not only do they offer innumerable Gelato flavors, but also cookies and other sweets, in addition to some sandwich and savory food options. We found each flavor we tried (Pistachio, Straciatella and Coffee) to be extremely delicious, and the consistency of the Gelato was better than the two other places I had tried during our trip. First, head to the cash register to say what size cup or cone you are looking for, then head to the counter to collect your Gelato! Their awning proclaims that Pompi is "The King of Tiramisu." I can't say I have tasted enough of this treat to agree or disagree (it's not really my bag), but I can say that the Tiramisu they turn out is quite delicious. 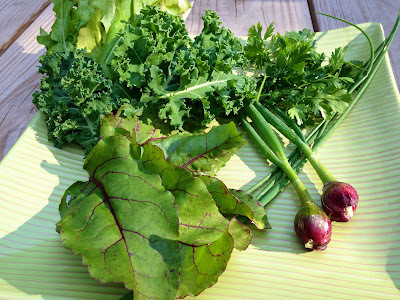 In addition to the "Classico," several other creative varieties are offered. These little cakes come to you neatly wrapped up in handy little cartons. A built in spoon allows you to enjoy Pompi's exceptionally fluffy, light, and flavorful Tiramisu on the go. What to Know - Again, head first to the cashier and place your order and pay. Then pick up your treat from behind the counter. We enjoyed the Classic and Pistachio (pictured) flavors. Fun Fact - the literal translation of Tiramisu is "pick me up." Last but not least, we happened upon a beautiful and expansive pastry and sweet shop called I dolci di Nonna Vincenza. The shop, near the Campo de' Fiori area, is a lovely place to just browse or even pick up some souvenir candies to bring home. 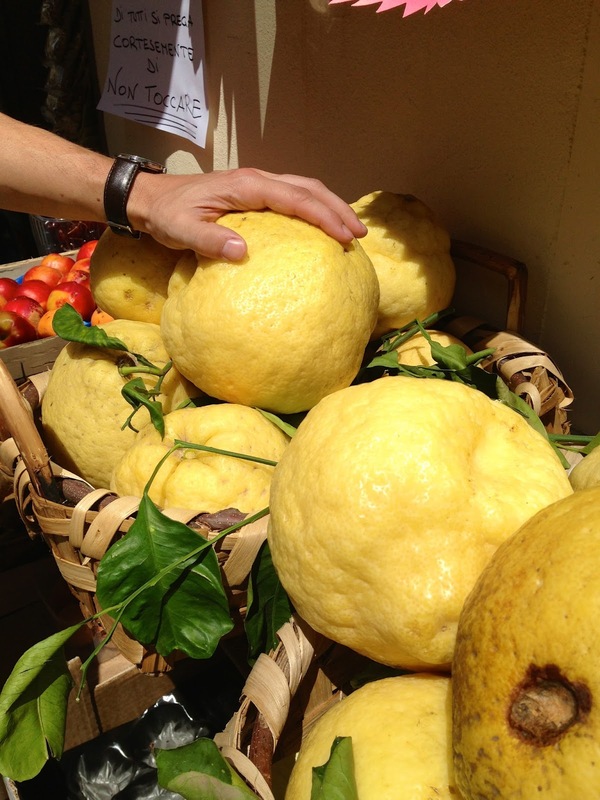 They also sell typical Italian Pastries and elaborate cakes. 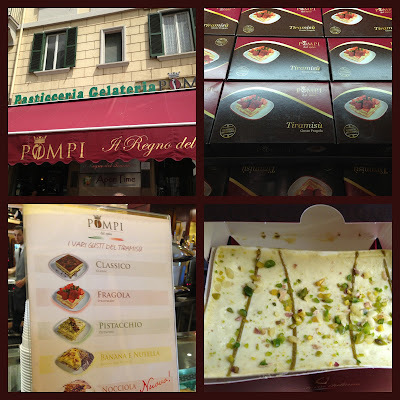 The staff was exceptionally welcoming and the beautiful Marzipan they sell was absolutely delicious. 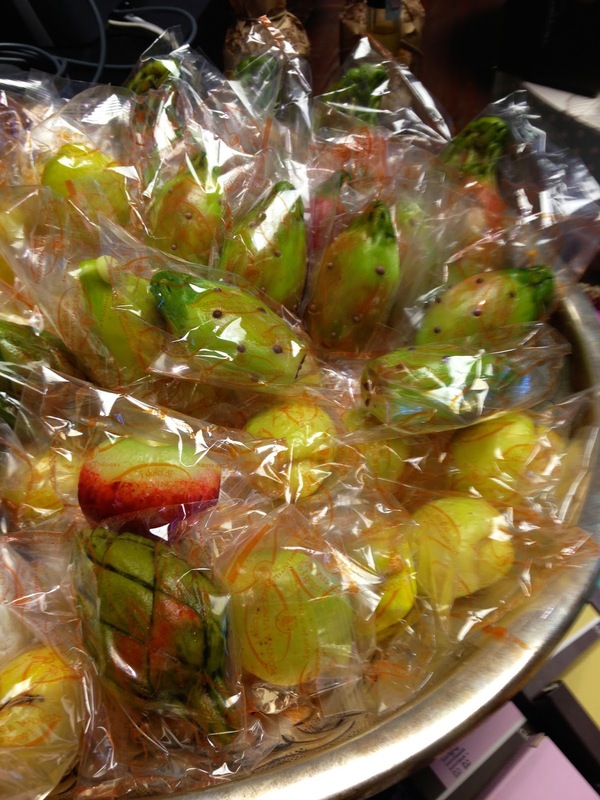 I was partial to the little Marzipan Artichoke! The Penne Arrabiata at Casa Coppelle was spicy, excellent perfection. Though the restaurant's ambiance was some of the best we experienced, some of our meals were just a bit spotty. I do, however, recommend this dish. I didn't think it would be possible to top but the Penne Arrabiata at Nino Ristorante, located a few blocks from the Spanish Steps, was fantastic. 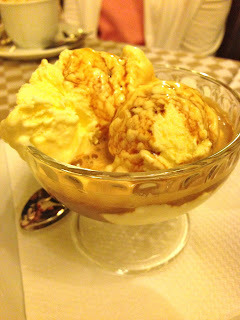 We actually had a superb meal at Nino, a restaurant focusing on Tuscan fare that has an old fashioned ambiance similar to Peter Luger (grumpy waiters included! ), for those of you who are familiar with the famous NY Based Steakhouse. The Marinated Eggplant was also a standout - check out my version HERE. 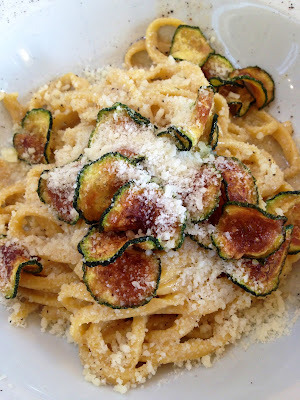 Here, we enjoyed several different types of pizza and my mother had a delicious dish of Tonnarelli Cacio e Pepe with Zucchini that I happily helped her finish - this was my favorite Cacio e Pepe (Pasta with Cheese and Pepper) of the trip. Finally, ordering Pasta Amatriciana is an absolute must when in Rome. Taverna Trilussa in Rome's vibrant, though gritty, Trastavere area (think the East Village on Saturday night) offered a notable version of this dish from the Lazio region. 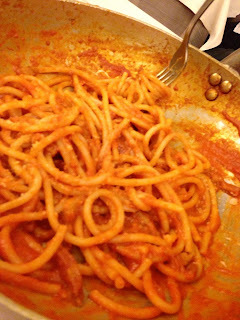 Classic Amatriciana sauce incorporates salty, smokey Guanciale (pork cheek similar to Pancetta) in a tomato based sauce. OH yes. 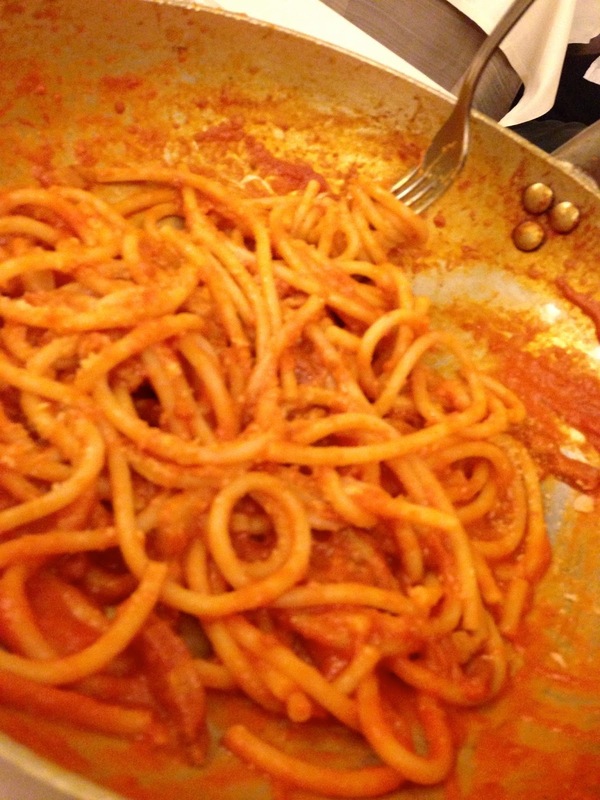 Fun twist - Trilussa serves their pastas it in your very own pot and tosses them tableside. We had a pretty good meal here with a few ups and downs, but it was clear by the number of locals in attendance that the hip and in the know seem to enjoy this place. I liked the true taverna ambiance complete with Prosciutto hanging from the ceiling, and the boisterous energy of the local patrons. Though terribly sad to leave Rome, we headed to Termini Station and hopped a speed train to Naples where we were then driven about 45 minutes to beautiful town of Sorrento that would serve as our home base for the next few days. From there, we visited the towns of Positano, Amalfi, and Ravello (our favorite). I hope you enjoy some of the highlights! The Amalfi Coast is pretty stunning. Still, there's always that pressing question: what does this region have to offer me food-wise? 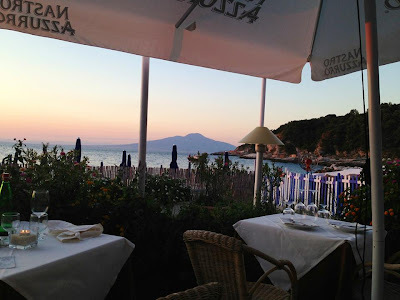 What to Know - This casual seaside restaurant in the quaint Marina di Puolo is slightly off the beaten path but so worth a visit. 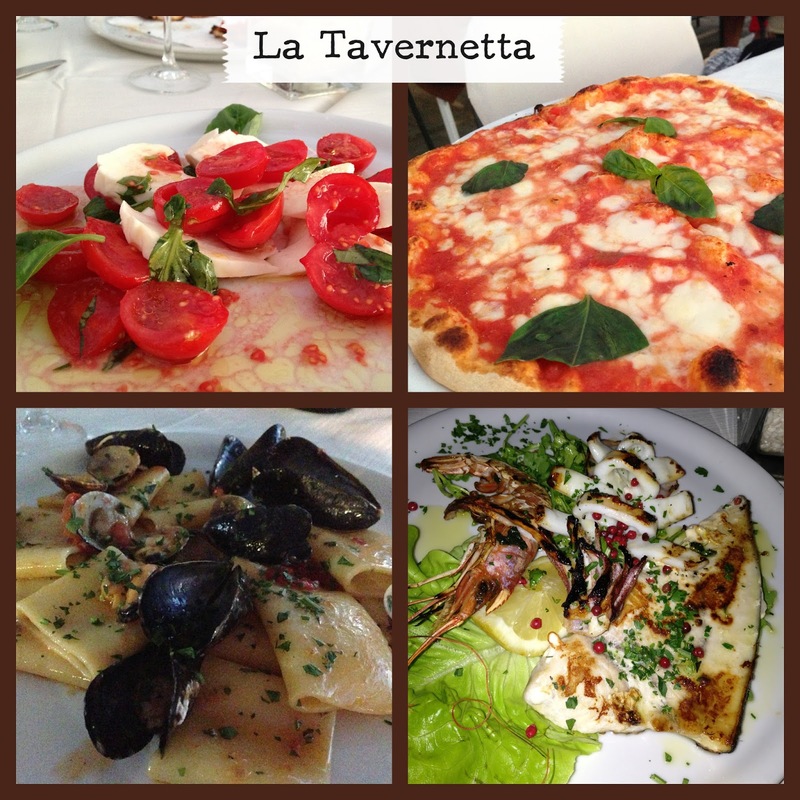 Family owned and run, there is another main location of La Tavernetta in Sorrento Town, but this sister restaurant, just about 15 minutes away, offers sea views and a free shuttle service to and from dinner. Comically, said "shuttle" ended up being a tiny four door coupe driven by a jovial Italian woman who spoke little English and who, shall we say, had a lead foot. I don't know if this is the case all the time, or just during the beginning of the season when we visited, but despite the less than luxurious ride, our trip was totally worth it. La Tavernetta serves absolutely great seafood (which is so obviously fresh off the day boat), along with extremely well executed traditional trattoria fare and Pizzas. The menu offers much variety and dishes are all unfussy, letting the freshness of the produce and fish really take center stage. 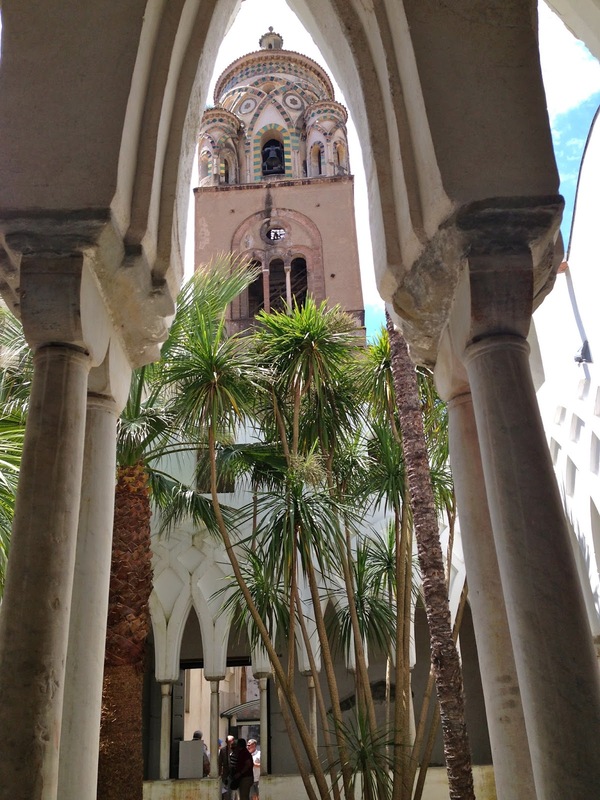 As an added bonus, this place is heavily frequented by locals, and it has a secluded feel to it that is really quite calming (especially after a white-knuckle ride!). 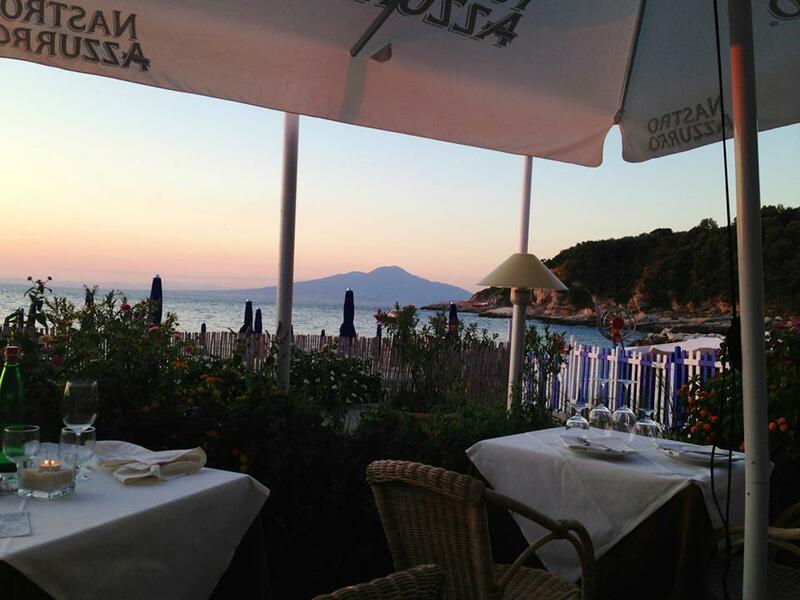 Sit back, relax, and enjoy the sun setting over Vesuvio in the distance. What to Know - This place is a gem. 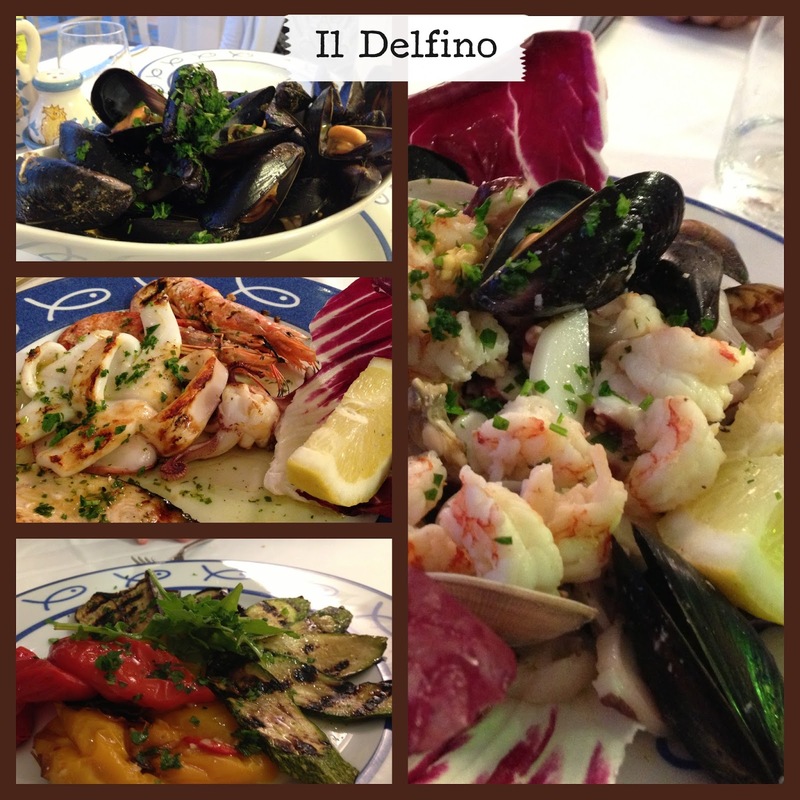 Beautifully nestled in the busy Marina Grande, Il Delfino serves up excellent, fresh seafood in a casual yet chicly designed nautical setting. 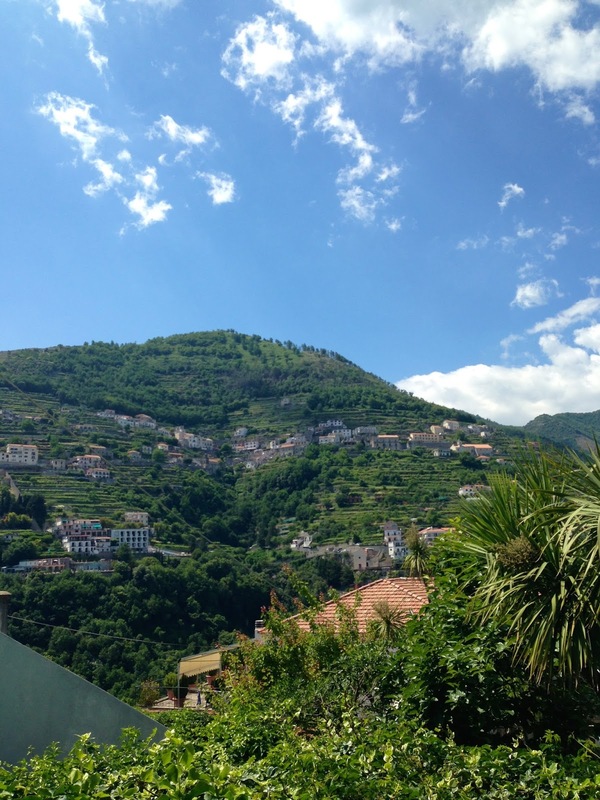 The restaurant is within a short, picturesque, yet steep walk from the town center (about 10 minutes). Wear flat shoes to navigate the sometimes unevenly cobbled streets and stairs. Outdoor seating is available but views of the bay are gorgeous from most tables. Recommended Dishes - Our Zuppa di Mussels (Cozze) were some of the best we've ever had, and the lemony Mixed Seafood Salad (right) was the stuff of dreams. Our mothers ordered Whole Sea Bass which was filleted tableside, simply flavored, and super fresh. My Linguine with White Clam Sauce (Vongole) was superb, though I am still partial to my own more broth-driven version (theirs was more Olive Oil based). 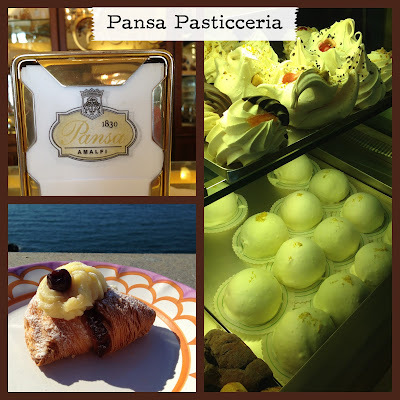 Andrea Pansa is a beautiful pastry shop in the center of the Town of Amalfi. In business since 1830 (! ), we dropped in to try a famous regional type of Sfogliatelle called Sfogliatelle Santa Rosa. Said to have originated in a convent, this version is unlike traditional Sfogliatelle in that it is filled with Cream rather than Ricotta, and includes Cherries. Look at it on the bottom left - delicious and majestic! Also try Delizie al Limone (bottom right) - another stellar sweet of the region that includes light sponge cake that is filled with Lemon Custard. Ok, that about does it for now. I hope you've enjoyed our Italian Culinary Roundup and that we've provided some helpful tips, or at least some cooking inspiration. To our Moms - for sharing this wonderful adventure with us. To True Italia - Our Travel Agent/Concierge Company. 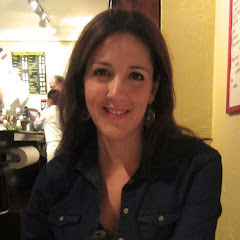 I highly recommend them and we've used their services twice both in Greece and Italy. 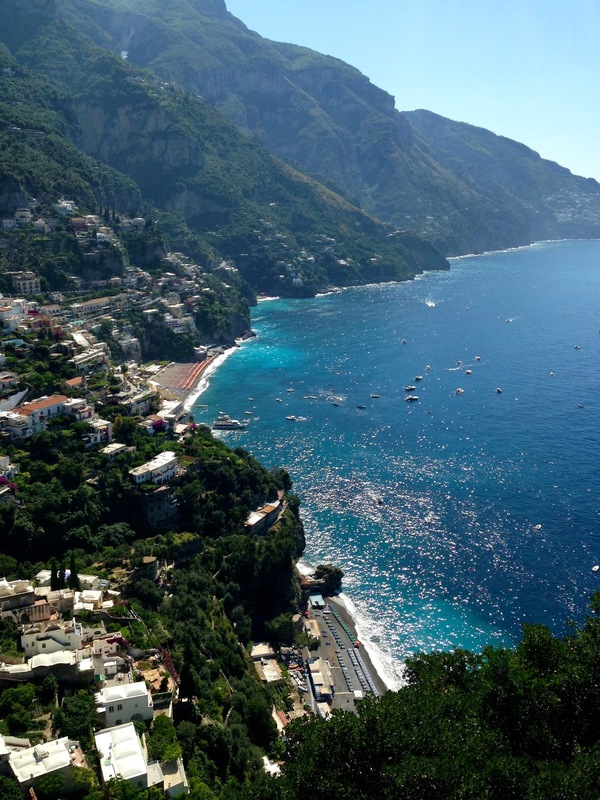 Check out True Italia for a totally gorgeous and stress free vacation (they aren't paying me to say this). 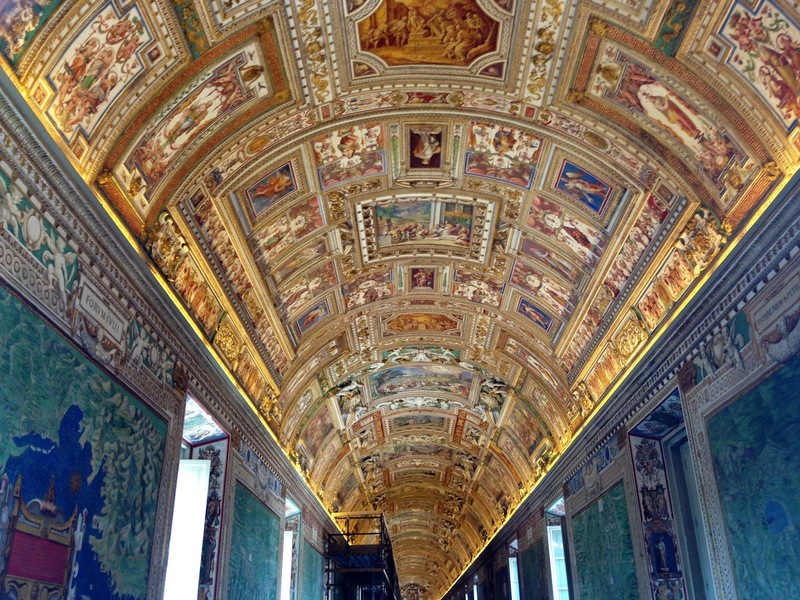 As a note, we stayed at the following hotels - the Sofitel Villa Borghese in Rome, and the Bellevue Syrene in Sorrento - I would recommend both to anyone. To Italy - for many great memories and, as always, endless culinary inspiration.